Since I shared with you the 3 things my mother taught me about teaching, I felt I should also share with you the 3 things my father taught me about teaching. By the age of 3, my father taught me that learning music would be part of my life forever. To him, it was like breathing. I am so grateful for the music and for the treasured lessons he taught me. I still use them today. 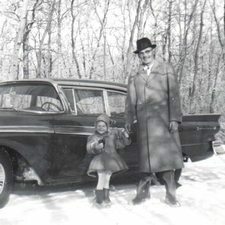 My father Jacob (Jake) was an amazing teacher and musician. He played piano, organ, accordion, guitar, bass, mandolin, harmonica, banjo, violin and sang in a Gospel Quartet and the church choir. He was a teacher of the important things in life. What matters most - is how you treat others. His gentleness, kindness and compassion in how he treated others is a testament to his character and an inspiration to me. My father grew up in a family of musicians. Not professionals, but the kind of musicians that LOVE to play and sing and be together to make music. Our family reunions were ALWAYS about the music. How VERY blessed am I to have grown up like this. I am truly grateful. That is why I want to share my lessons with you. The first thing my father taught me was "Learning Music the Right Way." 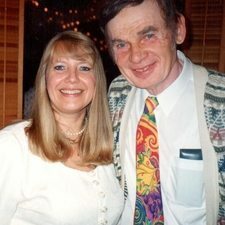 He was determined that my education in music would be something that I would not only enjoy, but that I would have an education of learning music correctly. The Number One thing was... RHYTHM. As we always had our family reunions with everyone playing, dad would say, " It doesn't matter if you play a wrong note now and then but ALWAYS stay in time". Since we couldn't afford a metronome, my dad would tap his yellow pencil on the piano while I practiced every day. In fact, there was a dent in the wood on the piano where dad would tap. Counting out loud, staying together as a group and learning to practice slowly, in time, until it was perfected. 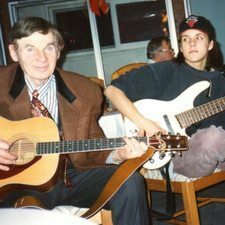 To this day, my lessons with my dad have made me a better teacher at encouraging my students to understanding the importance of rhythm - playing in time, counting out loud and learning music the right way. My dad also passed these lessons on to his grandchildren. 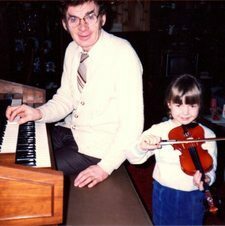 Here is a picture of Dad on the organ teaching granddaughter Sherry a few pointers on the violin. Dad insisted that they learn more than one instrument, including piano. The second thing my father taught me was “Patience and Understanding”. As I began teaching at the age of 16, my father guided me through preparing many lessons. He said the most important thing about teaching is patience and understanding. All students are different. Some are keen, others are shy, some have great natural abilities while others just have a desire to play music. Do not judge them, for whatever their reason for learning is, we must teach them with patience and understanding. We all have very busy lives, few people don't have an urgent "To-Do" list. We must understand that while they are "catching butterflies" (thinking about one thing and then wandering off to think about another thing, we now call it multitasking), we must pull them back into focusing on the lesson. Be patient with these students, they may be young with many activities to do, or they may be older with many responsibilities, but all of them have the same desire to learn music. My children were fortunate to have Grandpa teach them music as well. Here is Dad enjoying teaching grandson David a few "new licks" on the guitar. Eventually, David taught grandpa a few "new licks" on the guitar. My dad was SO patient that even if there was a fire in the building, he would calmly suggest going out of the building to avoid the danger. I'm not quite that calm... lol. But I try. The third and most important thing my father Jacob taught me was "It's NEVER too late to Learn Something New". My father realized the importance of continuing education and even though my parents owned several retail businesses, at the age of 45 my father went back to school to study and became a Chartered Accountant. I was very proud of him. Learning something new takes courage. Inspired by his teachings, I decided it was important for me to also go back to school. My studies concluded with me attaining my ARCT from the Royal Conservatory of Music in the year 2000. My father was SO proud of me the day that my exam marks came in the mail. First Class Honors. He knew I had made it. I performed my degree pieces for my mother, father and my husband Ray in a little mini performance in my studio the week before my exam. I had arrived. I did it. They were proud and I was proud. I could never have done it without the lessons my dad taught me... It's Never too late to Learn Something New. Thanks Dad. My father passed away the day that my diploma came in the mail. I couldn't bring myself to open the tube to look at my certificate. Going back to do a degree as an adult takes SO much energy and dedication. Our celebration was not going to be the opening of the certificate and hanging it on the wall (which I eventually did), but rather it had been the celebration of each step in the journey of doing it together. Psalm 96:2 Sing to the Lord. Praise His Name: Proclaim His Salvation Day After Day. P.S. Share the Treasured Lessons you have learned. I'd love to hear your stories, read your comments or answer your questions below. P.P.S. If you are ready to learn something new, start today. It's never too late. 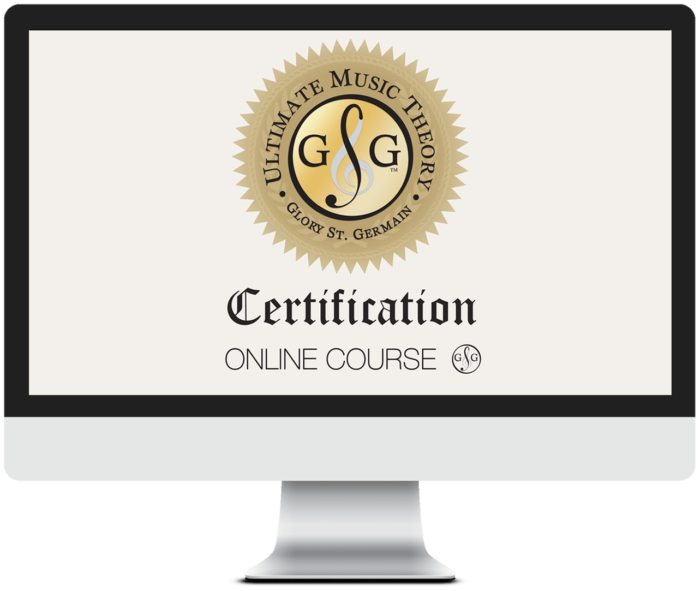 Learn more about the Ultimate Music Theory Certification Course for Teachers. You will learn more about yourself, your teaching style and how you can connect with your students better than you ever imagined. Learning something new takes courage - Yes You Can.